Your business needs a software partner, not just software, and Smart Service security dispatch software can become that. 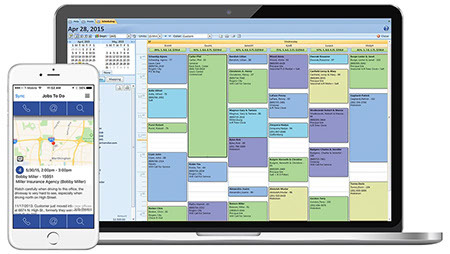 You can easily schedule, dispatch, manage, and track work orders in a user-friendly program. As an add-on for QuickBooks, it also serves as a convenient and easy-to-use dispatch software solution. By integrating your dispatch operations with your customer information in QuickBooks, you can utilize your existing customer data to make sure your technicians get sent to their jobs with everything they need to get the work done. Good scheduling and dispatching can mean a more efficient office, more scheduled jobs, and happier customers at the end of the day, so why not use all the tools available? Smart Service security dispatch software lets you add or change any technician’s schedule based on customer needs, and the easy-to-use interface means there’s no calling to double check who is where when on the phone with a customer. The days of multiple phone calls, digging through customer account information, or worrying about double-booking are over with Smart Service. One of the greatest pitfalls of proper dispatching is cohesiveness between dispatchers and technicians. Missed phone calls, keeping everyone up to date on finished and ongoing jobs, as well as scheduling new jobs can cause stress in the office. Smart Service security dispatch software links you to your technicians in a more efficient way. Any time a new job is added the technician will be notified with a real time update. And dispatchers can breathe a sigh of relief knowing that they know where everyone is, how long they will be there, and even if the job was finished or needs another appointment! Smart Service makes dispatching communication a snap. Scheduling a new job is only one part of effective dispatching. Getting the information to your technicians quickly and efficiently can be a little more difficult. The Smart Service mobile app makes this crucial part of the dispatch process simple! When you schedule a new job for a technician in Smart Service, it will pop up on the technician’s mobile device within the app. Information from the customer’s file (like GPS navigation, customer equipment, job history, and more) are now available for your technicians! They can even use the app to complete paperwork, take signatures, and create estimates. Back in the office, you can monitor your technician’s location and schedule. No frantic calls, no lost paperwork, no more stress! Smart Service dispatching software keeps you and your technicians on the same page. Request a free demo of Smart Service and let us show you how you can keep your business moving forward! Keep your business innovating with these tips!